Walking around this weekend's Sweet Tea Pumpkin Pie Festival, there was really just one question to ask: Why? Simple, according to Dave Mann, the musician who organized the two-day event featuring more than 125 bands performing at six restaurants along the U Street N.W. corridor: "If I'm going to fail," he said Saturday," I want to fail big." Mann dreamed up the Sweet Tea Pumpkin Pie Festival -- named for his music website, which was named for a band he used to play in, which was named for two of his favoritethings in the world -- this spring. Inspired by his visit this March to the massive South by Southwest music conference in Austin, Mann wanted to organize something similar, in which up-and-coming bands would play at local, off-the-beaten-path clubs in close proximity to one another. And so he booked a couple of bands he plays in. And his friends' bands. And his friends' friends' bands, locally and from out of town. He also reached out to promoters in Philly and New York, who sent some acts his way. And then, after first hoping to sell tickets, he decided to make it all free. That meant he couldn't pay the bands, but to hear him tell it, they were largely supportive: Maybe five bands pulled out at that point, he says. It's fair to say a lot of people (including The Washington Postand this publication) didn't know exactly what to expect from the festival, which featured a handful of smallish local indie-rock groups and tons of unknown out-of-towners. It didn't help that the festival gave out the email addresses of seemingly every music writer in town, which meant we were spammed by individual acts for days. I spent a few hours on Saturday and Sunday hanging out at the festival, and, well, it was weird. But I'm glad I went. It turns out that not unlike the mostly Ethiopian restaurants where it took place, Sweet Tea Pumpkin Pie was basically genre-agnostic. It might have been taste-agnostic, too. I saw lifeless roots rock, bro-ed out instrumental metal, hippie-happy Philly blue-eyed soul. I saw a Richmond hard-rock band do its best arena-rock impression in front of a crowd of 10 (the bass player, performing atop his amp, hopped to the ground and slid onto his knees while the bill's next group, loading its gear into the space, mockingly pantomimed him). I saw a schlubby dude in plaid channel the Counting Crows on electric piano. And a few times I found myself surprised. Philadelphia's Busses started out playing politely noisy indie rock, but by the end of their set they were spinning off into proggy, prismatic excursions. D.C.'s Frau Eva also had a prog side that suggested the more adventurous songs Fairport Convention wrote in the late '60s, but the sound was somehow cuddly, too. The band has grown a lot since it played on City Paper's roof during a snowstorm a year and a half ago. The economics are worth noting. Mann convinced six restaurants -- Ghion, Bella Cafe, 1920, Queen Makeda, Almaz and Dukem -- to allow him to use their space for free. The idea isn't new: For more than a decade, Ethiopian and Eritrean restaurants have been some of the easiest venues in D.C. for bands, DJ nights and open mics to get their start. Mann's innovation is scale. And his only expenses, he says, were promotional posters and some cash for one of the sound guys. Mann wants to put on another Sweet Tea Pumpkin Pie Festival in October. Some of the nominal headliners at this weekend's iteration were barely able to fill their rooms, though some were able to pack them. Next time, Mann says, he wants to bring in out-of-town bands that would otherwise be playing in venues the size of the Black Cat. He'd like to keep it free, which would mean arranging sponsorships with local businesses, he says. He says he'll find more volunteers, too. This weekend, he usually had one person at each venue checking IDs, while he ran from restaurant to restaurant in a continuous manic loop. 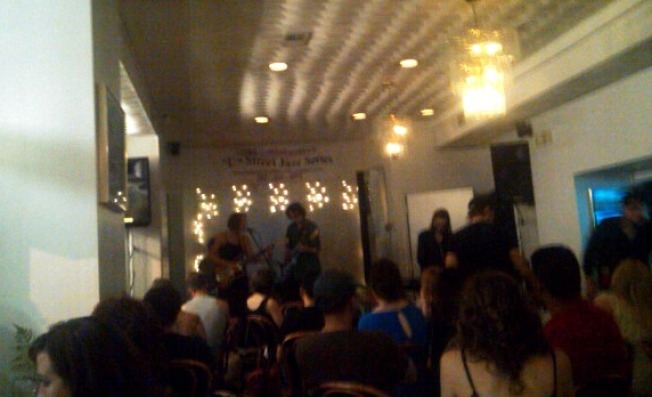 There are other lessons, to be sure: Dukem hosted some of Sweet Tea Pumpkin Pie's quieter bands on Saturday in an upstairs space adjacent to the main restaurant. But that room wasn't licensed for entertainment, according to Alcohol Beverage Regulation Administration spokeswoman Cynthia W. Simms, and the restaurant could face a fine. Bands booked for Dukem moved to the Islander restaurant across the street on Sunday, after Dukem received an ABRA warning Saturday. For me, Sweet Tea Pumpkin Pie was cool because it was unstressful. I wasn't there to see any band in particular -- since, after all, I had never heard most of them -- so I didn't overthink how to spend my time. If I wasn't feeling a band, I moved on to the next venue. I did that for hours on Saturday and Sunday. Around 11 p.m. last night, I wandered in the direction of Ghion, an Ethiopian restaurant on 9th Street, but I didn't hear drums crashing through the walls, as I had all day. Instead, a pretty, brittle voice drifted down the stairs, singing in a foreign tongue. Nigta looked embarrassed, and smiled. “This is my country’s music," she said. I left to check out the next venue, and she kept singing to an empty room. Sweet Tea Pumpkin Pie Festival: What I Learned was originally published by Washington City Paper on June 6, 2011.